Jose Mourinho's tactics were not to blame for Chelsea's Champions League defeat by Atletico Madrid, says former Blues forward Gianfranco Zola. Atletico came back from a goal down to beat Chelsea 3-1 in the second leg of the semi-final at Stamford Bridge. "Jose has always brought results," Zola told BBC London. "Unfortunately it didn't work out. "Sometimes you have to accept that the better team on the day won. I wouldn't put it down to the tactics." 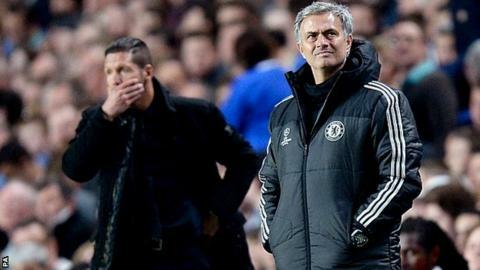 Chelsea had secured a 0-0 draw in the first leg in Madrid but Mourinho chose to line up with six defenders for the return leg in London. After Adrian Lopez cancelled out Fernando Torres's opener, Mourinho reacted by bringing on striker Samuel Eto'o. It was Eto'o who then conceded the penalty converted by Diego Costa, with Arda Turan wrapping up the tie with a third for the Spaniards. "There was a team in better condition, handled the pressure well, showed their composure even when they were losing and it was a big thing for Chelsea to handle," added 47-year-old Zola, who scored 80 goals in 312 games for the Blues. "I was surprised how good Atletico were. I was expecting Atletico to be a little bit more shy, but they were really good. They were the best team." Chelsea remain in contention to win the Premier League, but need both Manchester City and Liverpool to drop points if they are to have a chance of winning the title. "It's not over yet," said former Italy international Zola. "I wouldn't be surprised if you see something changing again. "I wouldn't be writing off Chelsea yet, but it's been a difficult season. The competition now is tough, even in England. We'll see what happens at the end of the season." The Italian, who was twice named Chelsea player of the year in seven seasons with the club, expects Mourinho to improve his squad over the summer for a concerted title bid next season. "Jose is clever," said Zola. "He's gone to Italy and won the title, he's gone to Spain and won the title, and in England too. If he needs to adjust he will adjust. "He will know what to do and will be competitive, there's no doubt about this." Asked whether he expected to be back in management in the near future, former West Ham and Watford boss Zola added: "Yes, I've no doubt about it. Hopefully next year I'm going to be there. "I have to find a team yet but we'll see. The priority is in England but we'll see what happens."